My new favorite apple pie recipe from Anna Olson. 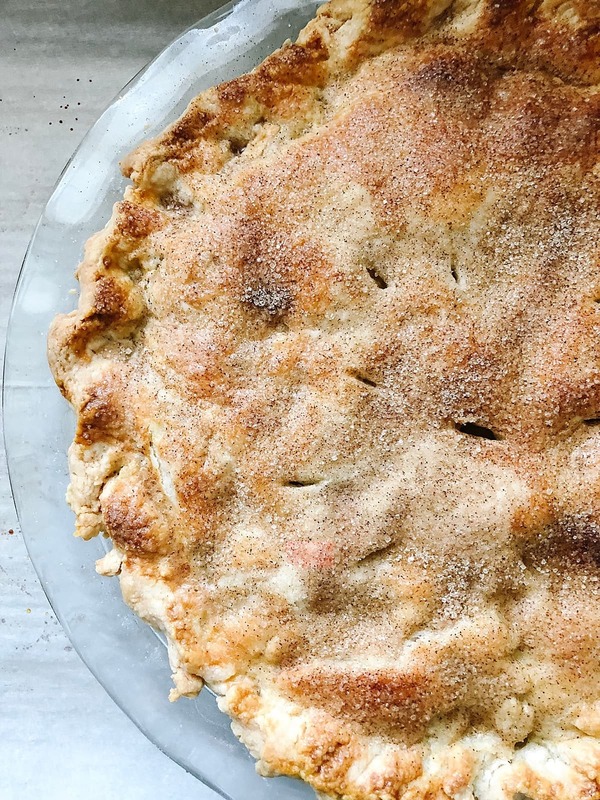 A fool-proof pie crust recipe with a secret ingredient to ensure no soggy bottoms. Perfectly spiced and scrummy. 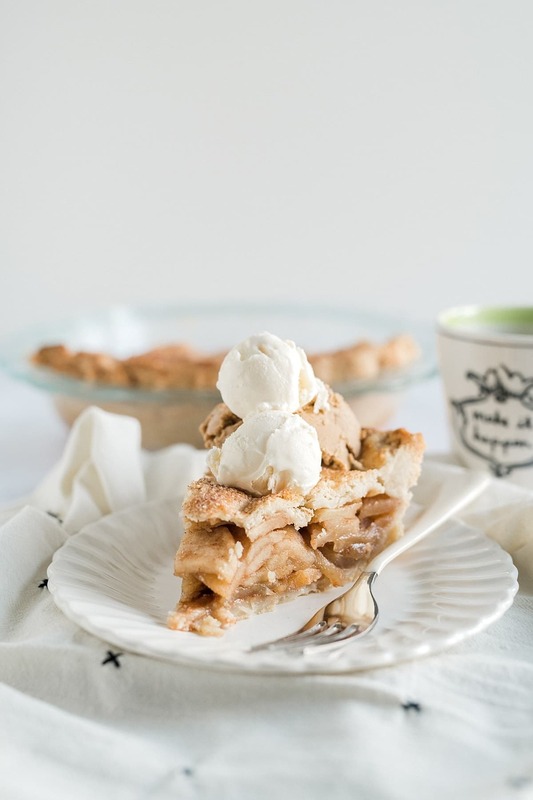 Apple Pie is my favorite kind of pie, hands down. 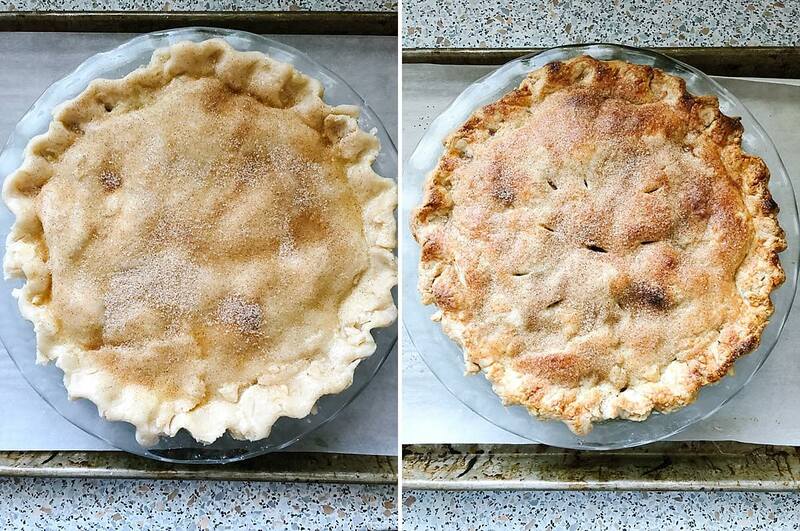 I have been making the same apple pie recipe for almost 15 years. 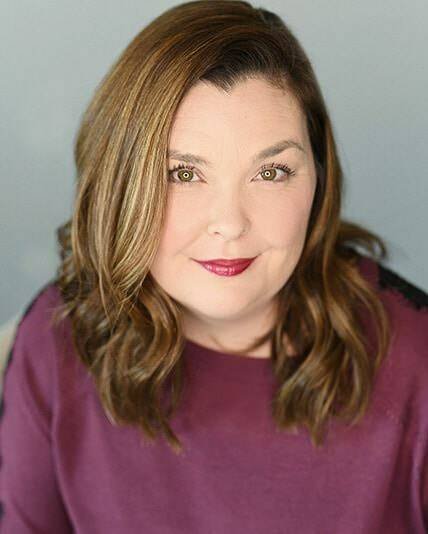 My friend Mary Jane brought it to my house when my oldest son was born and it’s been my go-to ever since. I found this Anna Olson recipe and I think that my recipe has been put securely in 2nd place. When Wes and I were in London a few weeks ago, we watched a lot of Food Network. I really miss watching cooking shows and it was a treat to have all English TV and lots of food shows. I am not great at making pie crust. It’s never awful, but it’s never amazing either. 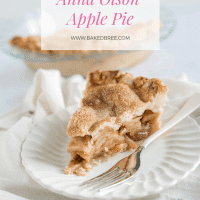 We watched a Bake with Anna Olson marathon and I came home wanting to try her pie crust apple pie recipe because she uses a technique that I thought would help me pie crust situation. 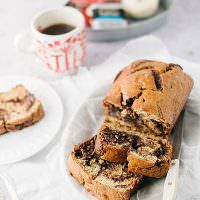 I had no intention of sharing this recipe, but I can’t keep it to myself, it’s that good. To make the stellar pie crust she adds a little oil to the flour before adding the butter. It makes it so that you can’t over-mix into the flour. The oil coats the flour and insulates it and won’t absorb all the butter. The butter can be a little bit softer than ice cold, it works in easier and faster making sure that your crust is flaky and tender. I made mine in a stand mixer, but you can use a pastry cutter or the food processor. She also cooks half of the apples before she adds it to the filling. It’s an extra step, but there was no extra liquid and her pie cut like a dream. 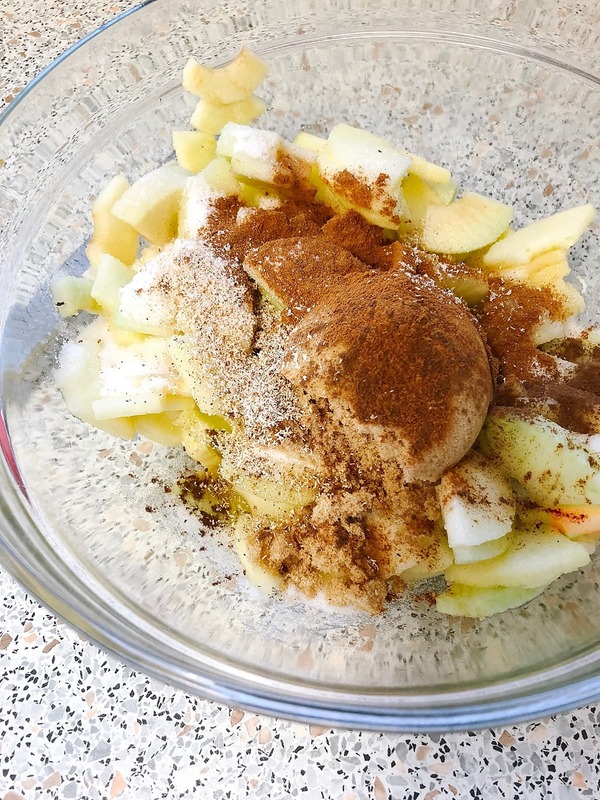 She also adds a little layer of oats to soak up any additional liquid from the apples. I came home from our trip, made it, and it was the best apple pie I’ve ever made. I served it (for breakfast, don’t judge) with some vanilla and salted caramel ice cream. If I wanted to be even more extra, I’d drizzle some maple bourbon caramel sauce on it. In a large bowl, combine the flour, sugar, and salt. Pour over the oil and mix until the flour is coated. It will look crumbly. Add the butter and cut or mix until small pieces of butter are still visible. Stir the water and vinegar together and add all at once to the flour mixture. Mix until the dough just comes together. Turn the dough out and gently work until it comes together. Cut dough in half and wrap each piece in plastic wrap. Chill for at least an hour. To make the pie, preheat your oven to 400*. Set out your pie dough for 15 minutes before rolling. Toss the apples with lemon juice. Add half of the apples to a sautés pan and cook over medium heat until most of the juices cook out and the apples soften, about 10 minutes. Use a slotted spoon and add the cooked apples to the uncooked ones. Add both sugars, cinnamon, allspice, nutmeg, and salt. Stir until combined. On a floured surface, roll the first dough to a little less than a 1/4 inch thick. Dust a 9-inch glass pie plate with flour. Transfer the dough to the pie plate. Sprinkle the bottom with oats. 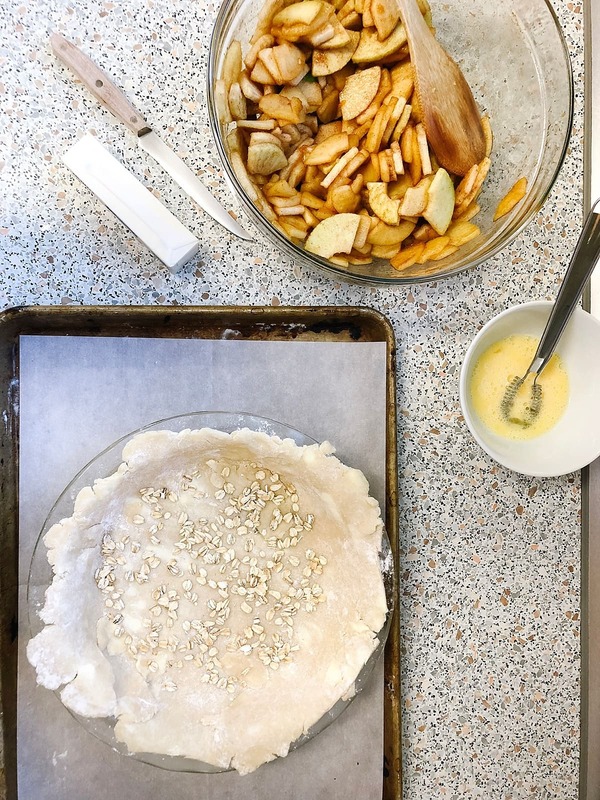 Add apple filling to the pie crust and dot with butter. Roll out second dough to the same thickness, drape over apples. Trim excess dough with scissors or a knife. Tuck under and then pinch to create a fluted edge. Whisk egg and 2 tablespoons water. 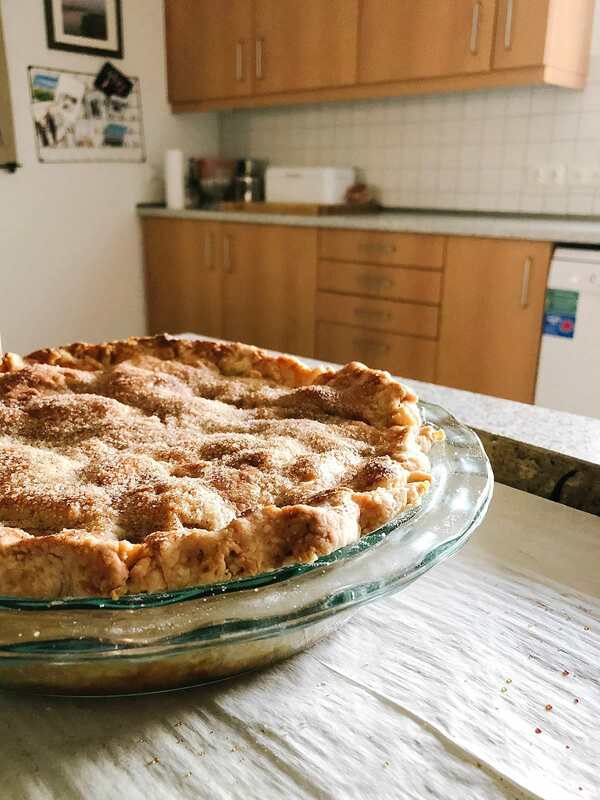 Brush over pie, sprinkle with cinnamon and sugar. 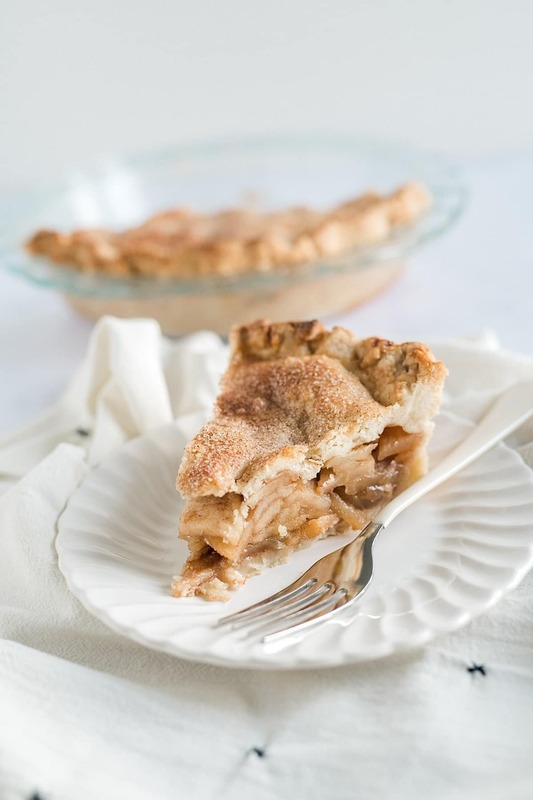 Use scissors to snip pie crust to allow steam to escape. Place the pie on a parchment lined rimmed baking sheet. Bake at 400° for 10 minutes, then reduce temperature to 375° and bake for another 40 to 50 minutes. The crust should be golden and the filling should bubble out of the vents. Cool for at least 2 hours before slicing. Notes: Pie dough can be kept in the fridge for 2 days or frozen for up to 3 months. Thaw in the fridge before rolling out. Adapted slightly from Anna Olson.